Lavern George Reilly was born on January 25, 1926 and joined the Armed Forces while in St. Paul, Minnesota. He served in the United States Air Force, 377 Support Squadron, and attained the rank of Colonel. Lavern George Reilly is listed as Missing in Action. Destin, Florida — Jeanne Reilly waited 34 years for her Air Force husband to return after his plane went down over Laos only three weeks after he had gone off to the war in Vietnam. Her wait ended Monday with a memorial service at Arlington National Cemetery in Washington, D.C., on the anniversary of his disappearance. Captain LaVern Reilly's plane, a C-47 transport, crashed on May 15, 1966 and he was listed as missing. His wife realized there was little hope he had survived only after American prisoners of war were released from Vietnam in 1973. "I had hoped for a long time, but I started to realize someone couldn't live that way for that long," Reilly, 75, told the Northwest Florida Daily News of nearby Fort Walton Beach for a story Monday. The woman, who had gone on to raise their five children while owning and operating a Fort Walton Beach restaurant, received word six months ago that her husband had been found. Air Force officials called to say remains were found at a crash site in Laos and those of her husband, promoted to colonel while listed as missing, were believed among them. The remains, however, were just fragments and her husband wasn't positively identified, said Johnnie Webb, the civilian deputy commander of the Central Identification Laboratory at Hickam Air Force Base, Hawaii. "They really haven't found anything," Reilly said. "I think they wanted to close the books and get off the case." The laboratory said it confirmed the death of her husband because it could identify remains of other crew members. Also, investigators doubted anyone could have survived the crash, based on the wreckage and noted a lack of live-sighting reports, Webb said. The couple had been high school sweethearts and were married for 19 years before he disappeared, Reilly recalled in an interview before leaving for Washington. Her eyes rimmed red as she spoke of him. "I just don't do very good at this, not good at all," she said. "It should get better, but it doesn't. That word, closure, I don't really have it that way." The Douglas AC47D, nicknamed Puff the Magic Dragon or Spooky, was a nocturnal savior to American and South Vietnamese troops at besieged outposts deep in Viet Cong and Pathet Lao-held territory. The AC47D had a row of 7.62mm miniguns mounted along the left side of its fuselage and could fly overhead in a pylon turn, bringing torrents of gunfire raining down on the enemy. On 15 May 1966, then Major George W. Jensen, pilot; Captain Marshall Tapp, co-pilot; First Lieutenant George Thompson, navigator; SSgt. James Preston, load master; Sgt. 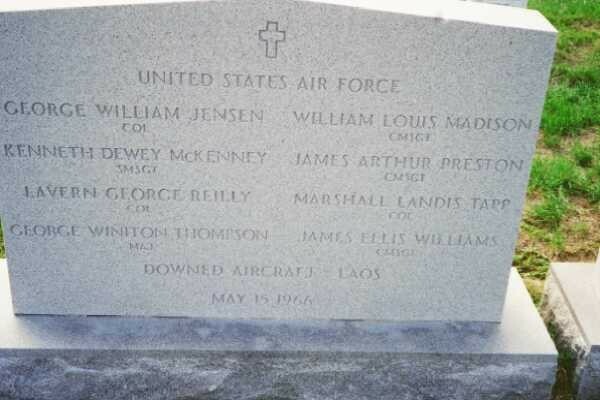 James Williams, flight engineer; A2C Kenneth McKenney, aerial gunner; SSgt. William Madison, aerial gunner; Major Lavern Reilly, observer; and two unidentified South Vietnamese crewman comprised the crew of an AC47D gunship (tail # 43-49546), call sign "Spooky 10." The gunship departed Ubon Air Base, Thailand on a 6-hour single aircraft armed visual reconnaissance mission to search out and destroy any enemy targets of opportunity they found along two known arteries of the infamous Ho Chi Minh Trail in the Steel Tiger sector of Laos. These roads were identified as #1: RLAF 146; and #2: Reccy Route 911 & 912. If time and fuel permitted, they were to investigate a new route suspected of being used by the enemy. At 1745 hours, Major Jensen established radio contact with the airborne command and control aircraft giving their status and position. The pilot transmitted again at 2100 hours, stating situation normal, but giving no position. The aircraft's last known position was over the rugged jungle covered mountains of the Lao panhandle approximately 3 miles west of a primary road leading directly through the Mu Gia Pass, which was a major port of entry into the Ho Chi Minh Trail. It was also located 1 mile south of the 17th parallel that separated North and South Vietnam, 15 miles due east of Ban Muong Sen, and 24 miles southwest of the Lao/South Vietnamese border, Savannakhet Province, Laos. When the gunship failed to return to the base as scheduled, an aerial search was conducted beginning at first light on 16 May. The search operation continued throughout the day, but failed to locate any sign of Spooky 10 or its crew. Further, no parachutes were sighted and no emergency beepers heard. At the time the formal search was terminated, all 8 Americans and the 2 ARVN aboard Spooky 10 were listed Missing in Action. On 7 June, some three weeks after the AC47D disappeared without a trace, a Pathet Lao radio broadcast was intercepted by US intelligence that described an American aircraft shot down over Central or Southern Laos and included in its list a reference to a C47 that had been shot down by a North Vietnamese anti-aircraft artillery (AAA) unit, PAVN Group 559, on 15 May. The report indicated all 10 crewmen were killed. However, in spite of the communist reports that everyone aboard Spooky 10 was killed in the crash; several live sighting reports and photographs of POWs in captivity were correlated to members of this crew. In addition, accounts of the name of at least one crewman - James Preston - having been heard by several returned POWs while in captivity has been documented. On 3 and 4 August 1994, a senior representative of the Vietnamese Office For Seeking Missing Persons (VNOSMP) had a chance encounter while in Saigon with a retired member of the People's Army of (North) Vietnam (PAVN), also known as North Vietnamese Army (NVA). The retired soldier related personal knowledge of a May 1966 crash of an American C47 in Laos that killed 10 crewman. This information was substantiated by a review of PAVN Group 559 records. On 3-4 August 1994, a team from Joint Task Force for Full Accounting (JTFFA) traveled to Khammouan Province, Laos to investigate a reported crashsite believed to be that of Spooky 10. As the team surveyed the area, they found aircraft wreckage and several aircrew-related items. Between 15 January 1995 and 1 September 1996, several JTFFA teams returned to this location to excavate the crashsite and " the 'three burial pits where the bodies of 10 or 11 men" were reportedly placed. The team found only a single-person burial pit. They found no trace of either reported multiple-person gravesites in or around the area. During the 6 excavations, the teams recovered wreckage consistant with AC47D, one size 10-jungle boot, a single dogtag baring the name of James Preston and a metal Captain's bar from a flight suit that was correlated to Marshal Tapp, the only Captain assigned to this flight. The team found and excavated the gravesite recovering 22 teeth or tooth fragments, 16 of which showed restorations. When the site was closed on 1 September 1996, the human remains were consolidated and transported to the Central Identification Laboratory, Hawaii (CIL-HI) for examination. In May 1999, US Air Force Mortuary Affairs presented each family with a highly inconclusive briefing book outlining the findings of CIL-HI's identification of the 22 teeth/tooth fragments and 23 small bone fragments. The CIL-HI report specified "the 22 teeth/tooth fragments matched the antemortem dental records and radiographs for Major Jensen to the exclusion of the other crewmen" involved in the incident and were positively identified as his. The results of the analysis dated 30 June 1997 also state "bone fragments include a rib fragment, two petrous temporat fragments (a right and a left), a fragment of mastoid process, two vertebral fragments. Most exhibit a yellow-brown coloration, except for the mastoid process fragment which is black due to exposure to heat. A number of fragments demonstrate fresh breaks along their edges." It went on to say "The 23 bones found at this site may also represent George Jensen, but were very fragmented and could not be individually associated to a specific individual. Further, none of the fragments could be excluded from being any or all of the crew involved in this loss incident." Because of their small size and condition, "mt-DNA analysis of the skeletal remains was not a viable option." And finally, the forensic anthropological report also states "the co-mingled remains associated with the crew of Spooky 10 are consistent with, but not exclusive to, human derivation." Despite the inconclusive results of the group identification and the lack of finding mass graves during the excavations, a forced group burial took place in Arlington National Cemetery on 13 December 1999. When questioned about their feelings about the group burial, Lavern Reilly's brother stated, "authorities just want to close the case. Military officials didn't identify each individual, but declared the men identified and accounted for despite a lack of dental records and DNA evidence." James Preston's daughter added, "They're going to have the ceremony whether we go or not." The eight-man crew of the AC47D are among nearly 600 Americans who disappeared in Laos. Many of these men were known to be alive on the ground. The Laotians admitted holding "tens of tens" of American Prisoners of War, but these men were never negotiated for either by direct negotiation between our countries or through the Paris Peace Accords which ended the War in Vietnam since Laos was not a party to that agreement. The Jensen family finally has the peace of mind of knowing where their loved one lies. However, for the remaining seven crewmen's families, lingering doubts are mixed with continuing questions. In spite of the forced acceptance, the families question our government's claim that the 23 bone fragments represent the total mortal remains of their men. Some of the families fear their loved one may still languish somewhere in Laos today in spite of our government's claims to the contrary.